Following the death of the legendary American soul singer Aretha Franklin, Apple CEO Tim Cook tweeted his condolences. "We mourn the passing of Aretha Franklin, the Queen of Soul," Cook posted to Twitter Thursday morning. "her voice will keep lifting us, through the music she gave the world. Our thoughts are with her family, her loved ones and fans everywhere. Take her hand, precious Lord, and lead her home." A towering figure in American popular and soul music, Franklin won 18 Grammy Awards and sold over 75 million records worldwide. Her biggest hits included "Respect," "Think," "(You Make Me Feel Like) A Natural Woman" and "Chain of Fools." Franklin died of cancer Thursday at age 76, a few days after a public announcement that she had entered hospice care kicked off a wave of tributes from throughout the music industry and beyond. 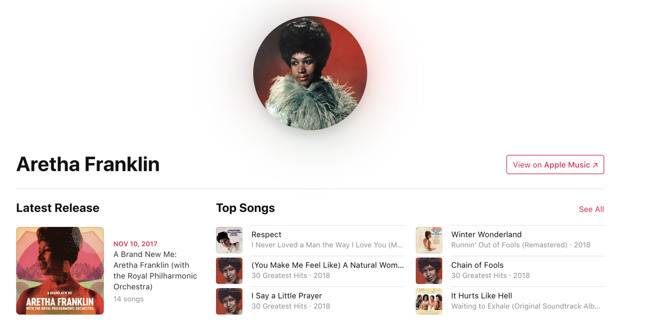 Most of the significant music in Franklin's catalog is available on Apple Music. Franklin also appeared last year in an Apple Music-exclusive documentary about music impresario Clive Davis.